Cut lemon in half and squeeze one half of the lemon juice into a small bowl. Cut the balance of the lemon into wedges. Set aside the juice and wedges. Cook and rinse the pasta. Drain well. Cut fettuccine into smaller pieces (about 2 inches or so in length). Set aside. Spray a skillet with non-stick cooking spray (I used butter flavored). Add garlic and onion and cook over medium heat until the softened. 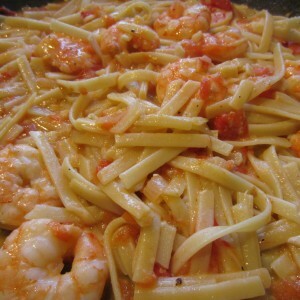 Add shrimp and tomato, stirring and turning shrimp until they are opaque (about 2 minutes or so). Stir in lemon juice, seasonings to taste and continue cooking for another minute. Note: the red pepper gives great flavor, just don’t add too much. A pinch or two is good. Pair this yumminess with a salad to complete the meal. Increase heat to medium high, add pasta noodles, mix well. 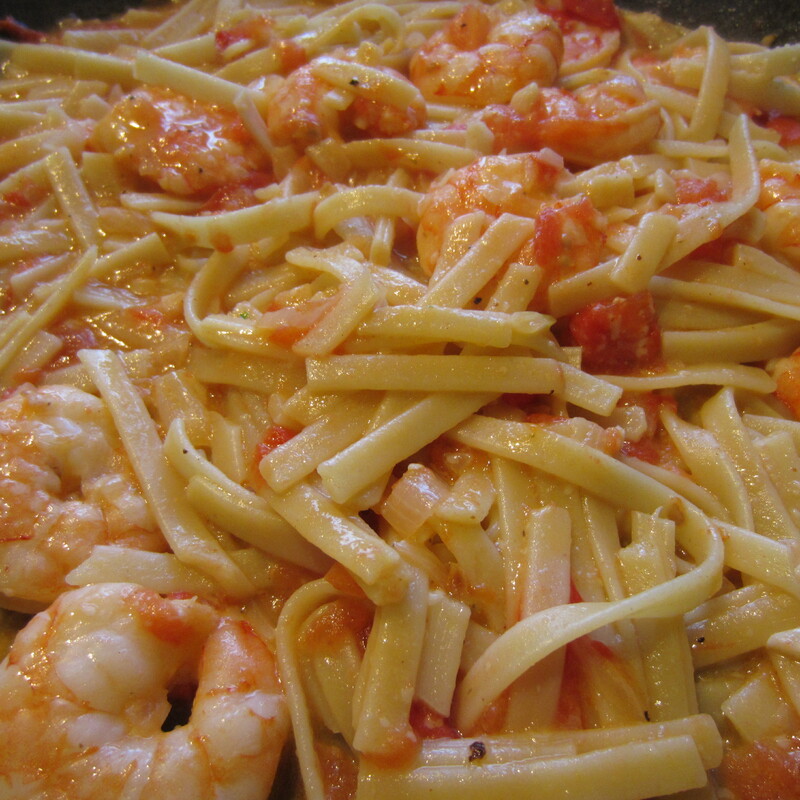 Cook for 1-2 minutes until the shrimp are cooked through and dish is hot. 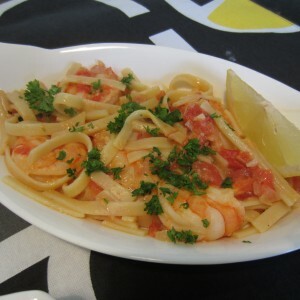 Plate the scampi and top with grated Parmesan cheese, a lemon wedge, and chopped parsley. Serves 3. Each serving is in the neighborhood of 290 calories. Tip: You can knock off 10 calories per serving if you substitute the butter for non-fat yogurt or non-fat sour cream.